Donning an eye-catching striped hat, a simple cream-colored shirt and flowing pants, items purchased in different Southeast Asian countries, Kawahara Keiichiro arrived for his interview with the Global Times over the recent National Day holiday. "Do I look like an ethnic minority from Yunnan?" joked Keiichiro, who had just finished volunteering in the province's Yiliang county, which was recently hit by earthquakes. 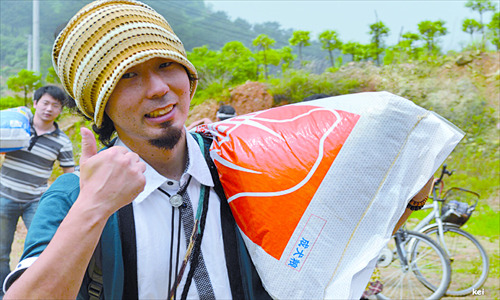 The 27-year-old man from Nagano, Japan, joined the relief effort shortly after the disaster that claimed 80 lives, providing medicine he collected from different cities to the wounded and helping locals clear away rubble. The ardent volunteer is on a world tour, with China being his first destination. Helping those in need is his major purpose on this journey, but during this time when the two Asian powers are wrangling over a cluster of islands, his experience in China has been laced with sudden twists. Keiichiro never expected that he would suddenly become famous because of a dramatic "bicycle incident." On the evening of February 17, the Japanese tourist left his beloved bicycle, his main mode of transportation, in the care of an elderly parking attendant while he was visiting Wuhan, Hubei Province. When he returned, both the keeper and his "best companion" had disappeared. He reported the loss to local police. A massive campaign to help the foreign friend trace his bicycle was soon launched on the Internet by netizens. On February 21, Keiichiro retrieved his bike at a local police station. The police said on its Sina Weibo that they found it after days of arduous investigation. However, many argued that police worked harder for him because he is a foreigner. Keiichiro understands people's frustrations. "It's people that found my bicycle," said Keiichiro, referring to warm-hearted Wuhan residents and Web users. "I know people weren't angry with me. They were angry with the police. Police care about foreigners because they don't want to lose face." The incident further inspired Keiichiro to do more good deeds in China. Behind his bicycle hangs a cardboard sign which reads "Come on, Japan! Thank you, China!" in Chinese. He explained that many Chinese lent a helping hand in 2011 after Japan was stricken by a devastating earthquake. Keiichiro once again came under the spotlight after a Weibo entry he posted on the night of September 17, when he was on his way to quake-hit Yiliang. "I was just attacked by a mob … though I'm not injured, I feel so sad," read the post, which in no time received wide attention. The unpleasant incident came during a tense time, when many Chinese cities saw large-scale demonstrations protesting Japan's "nationalization" of the disputed Diaoyu Islands. Keiichiro said he was leaving a small restaurant after eating dinner with two Chinese friends in Guiyang, Guizhou Province, when a crowd of about 30 men surrounded him and shouted "Kill him!" after somehow identifying him as Japanese. In order to save him, his friend told the thugs that Keiichiro was Korean. "I also said I was Korean," he recalled. "I didn't want to lie about my nationality, but I had to protect myself, my friends and the medicine I had." His friend's mother arrived on her motorcycle and took him away. But the episode didn't change his impression of Chinese people. "Only some people are like this. I have many good Chinese friends. They are really nice." In fact, in the over 80,000 comments on his Weibo entry, most people expressed their sympathy to him, and some even apologized. "I don't care about politics, I am just a volunteer," Keiichiro said. During the same period, people posted some anti-Japanese comments on his Weibo. "I don't care about it. If I did, I'd be depressed every day and I wouldn't be able to do anything," he said, adding that the "stupid island thing" would not affect his volunteer work. He believes that disaster relief should be a long process, during which the wounded need medical help and housing needs to be properly rebuilt. But some officials hastily shut down relief efforts, which he suggested might be done to give the impression that they have worked efficiently. Though officials in Yiliang sent him on his way when there was still much work to do, Keiichiro is undeterred and is already considering where he should volunteer next. Meanwhile, he continues to update lists of what people need in Yiliang and to share stories from his volunteering experience online and in public speeches. Keiichiro was first inspired to devote himself to providing medical supplies to people in need during a trip to Cambodia when he was an accounting major. There, he learned that an impoverished man had to amputate his young daughter's legs, which were badly infected after a minor injury. He entered nursing school after graduation and earned his nursing degree. After a series of volunteer activities in Japan and other Asian countries, he came up with the idea of touring the world. He hopes to settle in a country that really needs him and open an orphanage. "These children will help more children when they grow up," he said. Keiichiro said his trip is made possible with 5 percent money, 5 percent effort and 90 percent help from kind-hearted people. "I never take flights or expensive trains. I bike, walk or hitchhike." Keiichiro also said that he doesn't like money. "Money makes you crazy, makes you bad." That's why he never helps others by giving money. "If you're hungry, I'll give you food. If you're lonely, I'll give you a hug." As an experienced volunteer, he has his own take on this work. "Volunteering can be anything," he said. "You don't have to join an organization to help others." "Everyone is my teacher, and the world is my textbook," he said.